​Grow lights are artificial sources of light, usually an electric light, and are created with the aim to stimulate plant growth through the release of electromagnetic spectrum necessary for the process of photosynthesis. ​These lights are commonly used in settings without the presence of naturally-occurring light or where there is a need for additional light. A lot of people use them to grow plants in winter when the hours of daylight are not sufficient for the proper growth of plants. These lights provide a light spectrum similar to that of the sun or a one which is more tailored to the needs of the plants being grown. They are commonly used in horticulture, indoor gardening, and food production and plant propagation. Grow lights are artificial sources of light, usually an electric light, and are created with the aim to stimulate plant growth through the release of electromagnetic spectrum necessary for the process of photosynthesis. These lights are commonly used in settings without the presence of naturally-occurring light or where there is a need of additional light. A lot of people use them to grow plants in winter when the hours of daylight are not sufficient for the proper growth of plants. These lights provide a light spectrum similar to that of the sun or a one which is more tailored to the needs of the plants being grown. They are commonly used in horticulture, indoor gardening, and food production and plant propagation. Light Emitting Diodes known as LED lights. 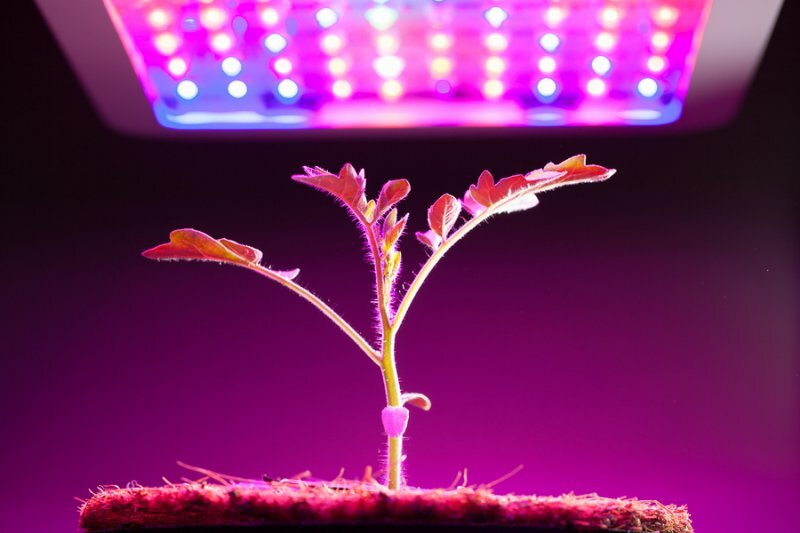 LED grow lights are the newest generation of efficient and highly-economic grow lights, with a significantly reduced size designed with the purpose to be easily incorporated into smaller areas. In the past, grow lamps were overly hot, massive, fluorescent tubes longer than one meter and they required a lot of stands, cables, and reflectors. On the other hand, LED lights are light and thin enough to be fitted almost anywhere. They have so many benefits and one of them is that people who live in dark and urban or north-facing apartments can grow houseplants without worrying about the lack of light. According to James Wong from The Guardian, using LED grow lights significantly contributes to stronger plants, earlier harvest, and minimal power usage. A variety of bulb types can be used as grow lights, that is, there are incandescents, fluorescent lights, HID lamps, and Light Emitting Diodes known as LED lights. LED grow lights are the newest generation of efficient and highly-economic grow lights with a significantly reduced size designed with the purpose to be easily incorporated into smaller areas. In the past, grow lamps were overly hot, massive, fluorescent tubes longer than one meter and they required a lot of stands, cables, and reflectors. On the other hand, LED lights are light and thin enough to be fitted almost anywhere. They have so many benefits and one of them is that people who live in dark and urban or north-facing apartments can grow houseplants without worrying about the lack of light. According to James Wong from The Guardian, using LED grow lights significantly contributes to stronger plants, earlier harvest, and minimal power usage. ​LED grow lights contain light-emitting diodes in a casing with a heat sink and built-in fans. They do not require a different ballast, and they can be plugged directly into an electrical socket. They have different colors, and their usage depends on the purpose of the light. To illustrate, green, red, far-red, and blue light spectra are considered good for root formation, the growth of plants, as well as flowering. It is important to note that LED grow lights need to be kept at least 12 inches away from the plants in order to prevent leaf burn. Even though they have a higher price than other types of grow lights, they are energy-efficient and a long-lasting investment. LED grow lights contain light-emitting diodes in a casing with a heat sink and built-in fans. They do not require a different ballast, and they can be plugged directly into an electrical socket. They have different colors, and their usage depends on the purpose of the light. To illustrate, green, red, far-red, and blue light spectra are considered good for root formation, the growth of plants, as well as flowering. It is important to note that LED grow lights need to be kept at least 12 inches away from the plants in order to prevent leaf burn. Even though they have a higher price than other types of grow lights, they are energy-efficient and a long-lasting investment. 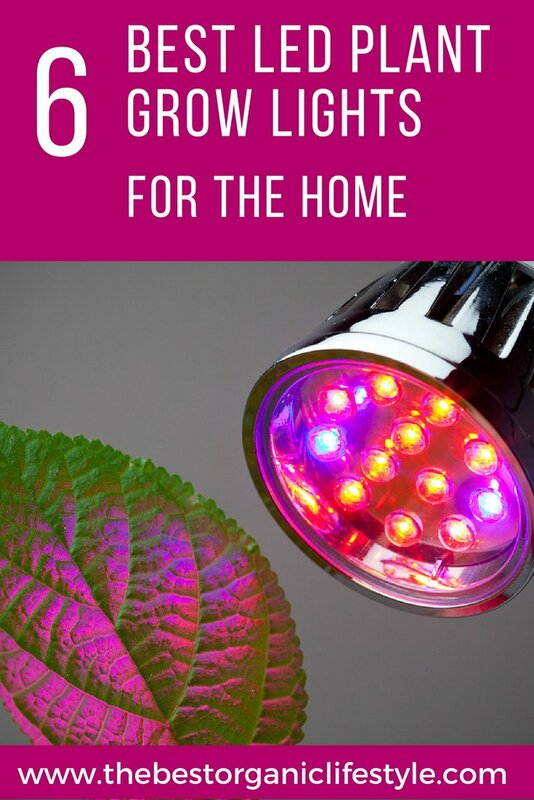 ​If you are thinking of switching to LED grow lights for your indoor garden or greenhouse, or if you have never used them before and you would like to try them out, you should not make a final decision before doing thorough research. You need to find out which lights are the most suitable for the type of plants you want to grow and to find out the most quality ones, of course, with a reasonable price that will be within your budget. With this in mind, we prepared a list with the 6 best LED grow lights. If you are thinking of switching to LED grow lights for your indoor garden or greenhouse, or if you have never used them before and you would like to try them out, you should not make a final decision before doing thorough research. You need to find out which lights are the most suitable for the type of plants you want to grow and to find out the most quality ones, of course, with a reasonable price that will be within your budget. With this in mind, we prepared a list with the 6 best LED grow lights. 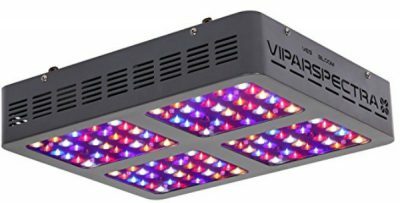 ​The LED Grow Light, Series 600W by VIPRASPECTRA has a full spectrum layout, reflector design, and upgraded aluminum cooling heat sinks and it is perfect for different types of indoor plants, vegetables, and flowers at all stages of growth. The reflector has been developed by indoor growers after years of careful experimentation and testing. The light from this reflector will lead to an increase in quality by growing bigger and denser flowers coated in resin. This design is not overly concentrated in the middle of the growing area, and it will not impede plant growth and burn the plants. It requires no additional ballast, and it can be controlled with the help of a timer. However, this type of grow light is not waterproof, and it is designed for indoor use only. It is important to note that the high-intensity lights are rather intensive and you should not look at them when they are on. At the price of $179 and a 3-year local warranty and additional 30 days satisfaction or return guarantee, this is a top quality grow light for newbies and advanced growers. 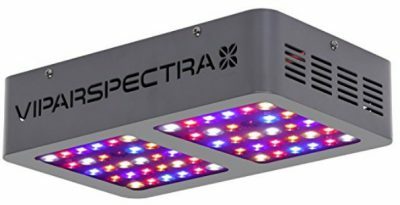 The LED Grow Light, Series 600W by VIPRASPECTRA has a full spectrum layout, reflector design, and upgraded aluminum cooling heat sinks and it is perfect for different types of indoor plants, vegetables, and flowers at all stages of growth. The reflector has been developed by indoor growers after years of careful experimentation and testing. The light from this reflector will lead to an increase in quality by growing bigger and denser flowers coated in resin. This design is not overly concentrated in the middle of the growing area, and it will not impede plant growth and burn the plants. It requires no additional ballast, and it can be controlled with the help of a timer. However, this type of grow light is not waterproof, and it is designed for indoor use only. It is important to note that the high-intensity lights are rather intensive and you should not look at them when they are on. At the price of $179 and a 3-year local warranty and additional 30 days satisfaction or return guarantee, this is a top quality grow light for newbies and advanced growers. ​The LED Grow Light, Series 300W by VIPRASPECTRA is engineered with the purpose to keep a balance between PAR/Lumen output and coverage. This popular and superior LED grow light is a basic LED light panel, which makes it a good reflector for newbies. It has a full light spectrum, from IV to UV wavelengths. The LED panel will not run hot or burn the plants because the generated heat is controlled by fans and heat sinks. It comes at the price of $79 and a 3-year warranty plus 30 days satisfaction or return guarantee and you can use it for all stages of plant growing. Nevertheless, since the light is intensive, you should not look directly into the reflector and use protective eyewear when you are near it. And, the grow light is not for outdoor use. The LED Grow Light, Series 300W by VIPRASPECTRA is engineered with the purpose to keep a balance between PAR/Lumen output and coverage. This popular and superior LED grow light is a basic LED light panel, which makes it a good reflector for newbies. It has a full light spectrum, from IV to UV wavelengths. The LED panel will not run hot or burn the plants because the generated heat is controlled by fans and heat sinks. It comes at the price of $79 and a 3-year warranty plus 30 days satisfaction or return guarantee and you can use it for all stages of plant growing. 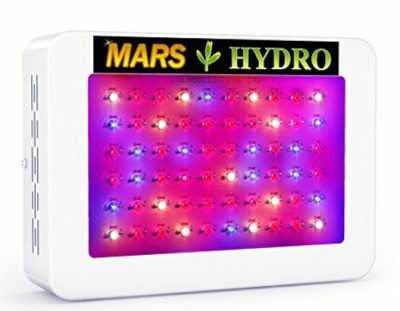 ​The Galaxyhydro 300W Plant Grow Light by Roleadro is one of the most practical grow lights that will help you get the most of the plants you are growing without actually exhausting them. It supplies only the necessary light for the plants, and avoids additional light which could lead to​ extra electricity bill charges. It has 2 cooling fans and a sunflower radiator system, one of the best heat dissipation systems, and a very quiet one. This grow light is perfect for a 2x2 growing area at a 25” height. 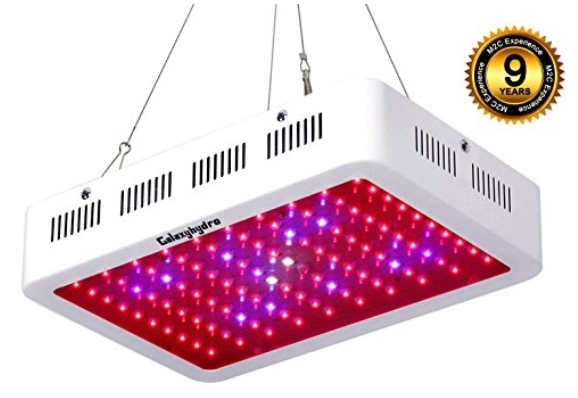 Nonetheless, you should not opt for this grow light if your grow space is small, but with high levels of humidity. Also, this grow light is not created for outdoor use. At the price of $77.99 and a 2-year warranty, this is a reasonable and effective investment in your indoor garden. The Galaxyhydro 300W Plant Grow Light by Roleadro is one of the most practical grow lights that will help you get the most of the plants you are growing without actually exhausting them. It supplies only the necessary light for the plants and no other light which could lead to additional electricity bill charges. It has 2 cooling fans and a sunflower radiator system, one of the best heat dissipation systems and a very quiet one. This grow light is perfect for a 2x2 growing area at a 25” height. Nonetheless, you should not opt for this grow light if your grow space is small, but with high levels of humidity. Also, this grow light is not created for outdoor use. At the price of $77.99 and a 2-year warranty, this is a reasonable and an effective investment in your indoor garden. 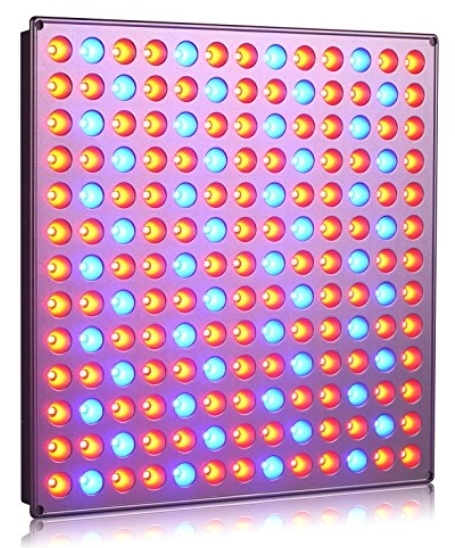 ​The Panel Grow Light Series 45W by Roleadro comes with red and blue light spectrum and a high-quality aluminum back panel. It is perfect for various types of indoor veggies and flowers, especially when at seeding stage. The red light is essential for photosynthesis and the blooming process whereas the blue light is best for quality leaves. More leaves will appear within 12 days of using the panel daily. What is great about this lamp is the higher amount of power, but low power consumption. It comes at the price of $26.99 and a 12-month warranty and 30 days return guarantee. As the panel is not waterproof, it can be used only indoors. Moreover, it must not be used more than 18 hours continuously because its lifespan will be negatively affected. The Panel Grow Light Series 45W by Roleadro comes with red and blue light spectrum and a high-quality aluminum back panel. It is perfect for various types of indoor veggies and flowers, especially when at seeding stage. The red light is essential for photosynthesis and the blooming process whereas the blue light is best for quality leaves. More leaves will appear within 12 days of using the panel daily. What is great about this lamp is the higher amount of power, but low power consumption. It comes at the price of $26.99 and a 12-month warranty and 30 days return guarantee. It comes with 60 small LED lights which produce 300W and a power consumption of up to 135W, which means that it is energy efficient and you will not have to worry about a through-the-roof electricity bill. It has a full spectrum, and it can be used for growing vegetables, flowers, as well as cannabis. This is a safe and eco-friendly grow light which does not emit a chemical or electrical smell. At the price of $65.99 and a 1-year warranty and a 30-day refund, it is a reasonable option for your indoor garden. 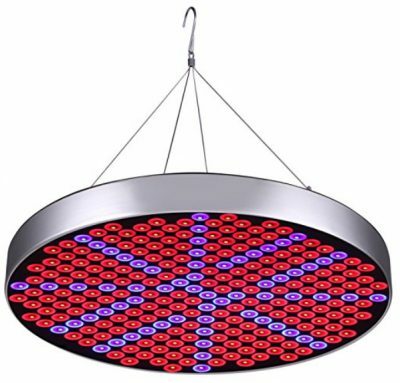 It is crucial to note that this type of grow light is not recommendable for professional purposes, that is, more significant growing areas and it is designed for indoor use only. The 300W LED Grow Light by MarsHydro is a quality grow light at an affordable price. It is famous among growers for its energy saving mode. If you are looking for a grow light for seeding, this is a perfect choice. It comes with 60 small LED lights which produce 300W and a power consumption of up to 135W, which means that it is energy efficient and you will not have to worry about a through-the-roof electricity bill. It has a full spectrum, and it can be used for growing vegetables, flowers, as well as cannabis. This is a safe and eco-friendly grow light which does not emit a chemical or electrical smell. At the price of $65.99 and a 1-year warranty and a 30-day refund, it is a reasonable option for your indoor garden. The 50W LED Plant Grow Light by Shengsite has a 3:1 spectrum ratio of red and blue which is the optimal ratio for seedling and the vegetative state of plants. The red light focuses on the plant budding stage, the flowering, and fruiting and it also contributes to a high yield; the blue one betters the protein accumulation and increases the weight of the plant. This being said, with the help of this grow light, you will have healthy and lush plants in your indoor garden. The light comes with a hanging kit so that you can hang it on the ceiling and place the plants beneath it. You can purchase it for $26.99, and it comes with a 1-year warranty and 30 days satisfaction or return guarantee. So, if you are growing strawberries, flowers, seaweed, green peppers, tomatoes, and grapes, this is one of the best choices you can make. However, you should not opt for this grow light if you intend to use it outdoors because it is not waterproof. Some users have also reported that the mounting can be a bit tricky because it has only 4 small holes for long screws. All in all, depending on the grower’s preferences, needs, and of course, budget, that is, whether they have a bigger or a smaller growing area or whether they grow vegetables or flowers, they have 6 top quality models to opt for, from more pricey grow lights to inexpensive ones. No matter which one you choose, their sophistication will contribute to the growth of fresh and healthy crops all year long, regardless of the season. They are eco-friendly and produce much less heat and humidity than other types of grow lights. Cultivators will especially appreciate the flexibility in design and placement of these grow lights. If you have any questions, please leave them in the comments. We always try to answer as best we can! All in all, depending on the grower’s preferences, needs, and of course, budget, that is, whether they have a bigger or a smaller growing area or whether they grow vegetables or flowers, they have 6 top quality models to opt for, from more pricey grow lights to inexpensive ones. No matter which one you choose, their sophistication will contribute to the growth of fresh and healthy crops all year long, regardless of the season. They are eco-friendly and produce much less heat and humidity than other types of grow lights. Cultivators will especially appreciate the flexibility in design and placement of these grow lights. The 50W LED Plant Grow Light by Shengsite has a 3:1 spectrum ratio of red and blue which is the optimal ratio for seedling and the vegetative state of plants. The red light focuses on the plant budding stage, the flowering, and fruiting and it also contributes to a high yield; the blue one betters the protein accumulation and increases the weight of the plant. This being said, with the help of this grow light, you will have healthy and lush plants in your indoor garden. The light comes with a hanging kit so that you can hang it on the ceiling and place the plants beneath it. You can purchase it for $26.99, and it comes with a 1-year warranty and 30 days satisfaction or return guarantee. So, if you are growing strawberries, flowers, seaweed, green peppers, tomatoes, and grapes, this is one of the best choices you can make.